Some 47 weeks later, the Ottawa Gee-Gees will take another crack at solving the Kevin McCleery situation. The Ravens big man is a good focal point for Wednesday's MNBA Capital Hoops Classic between No. 2 Carleton and No. 5 Ottawa. Mentioning how McCleery cleaned up in last season's installments of the Canal War, averaging 22 points as the Ravens went 3-0 vs. Ottawa, segues into how it (stress, might) unfold at Scotiabank Place. By Rob's reckoning, based on points for and against and Simple Rating System, we have a rough idea that Carleton might come out on top by something like a 78-70 score. There is a lot of leeway within that, enough to count on a close game. 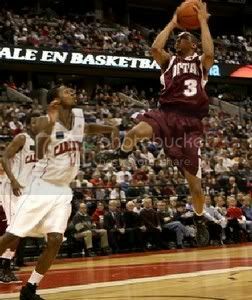 The Gee-Gees offer a great story line with their guard combo of CIS assists leader Josh Gibson-Bascombe (pictured) and three-point ace Donnie Gibson, the only two Gee-Gees who have experienced a win over Carleton at Scotiabank Place. Ottawa has more than a puncher's chance with WWJD (Warren Ward, Josh and Donnie). However, Carleton can utilize McCleery and its array of shooters to set the pace, which might ultimately be the tipping point. The risk here is dwelling too much on past performance. The rub there is Carleton-Ottawa always seems like a resumption of a Risk game that's been going on for years, rather than a stand-alone event. You wonder where the coaching staffs keep the board when they're not playing, like Kramer and Newman in that Seinfeld episode. You don't need any reminder of how Carleton plays. This post is part about gauging how the game might go and part reflecting on how Dave Smart has adapted its controlled offence to the 24-second shot clock CIS switched to 2½ seasons ago. There were articles written in 2006 about how coaches were four-square against lopping six seconds off the shot clock. Some reports said almost 90 per cent of the coaches were against going to the FIBA rules, worrying it would lead to sloppy play. At that time, others wondered if the switch could be called the "Carleton rule." People were used to seeing the Ravens win national titles, pulling one 52-49 and 60-47 game out of the fire after another. Their run to their fifth title included some bumps in the road courtesy some up-tempo teams. Ottawa swept the regular-season series and York also won at the Ravens' Nest, scoring 61 points in a single half. It was reasonable to wonder if the running teams such as coach Dave DeAveiro's Gee-Gees might make out like bandits with the change. Instead, Carleton is 6-0 vs. Ottawa in the 24-second shot clock era. The Gee-Gees, who are averaging a fairly typical for them 83.4 points, have been held to 73 or less in each of those games. The game was supposed to have been sped up, but the team which plays the patient game, drawing out each possession to get a good look, still has the upper hand. Someone might interject and say, well, Carleton clearly has started to run more. It is easy to think that since the Ravens have averaged 85, 89.1 and 85.8 points (the latter through 14 games this season) since the 24-second shot clock was introduced, a big jump from the prior three seasons (73.4, 77 and 77). However, they still have one of the lowest Pace Factors in the OUA. What has happened is Carleton is really good at scoring more in fewer possessions. This season has been pretty illustrative. Carleton is leading the country in field-goal percentage while taking 40% of their attempts from outside the 3-point line, which is also the highest percentage in the country. A lot of that is having post players who can pass. Watching Carleton's games on videocast, McCleery seems to have become a stronger finisher and more adept at passing to an open teammate when the double team comes. He's borderline unguardable. Stats don't win games, athletes do, but hopefully this helps show what Carleton has going for it on Wednesday. They will, as is their wont, slug the ball inside to McCleery, and if a shot doesn't present itself, they'll get it out to three-point marksmen such as Mike Kenny (making almost 50% of his threes since New Year's) and Elliot Thompson, who hit some big buckets off the bench in last season's Hoops Classic and is now higher up in Smart's rotation. McCleery, averaging 15.6 points and shooting a CIS-best 63% from the floor, had his way with Ottawa last season. The Gee-Gees' best interior defender, Dax Dessureault, has graduated and Ottawa is now less seasoned at the 5-spot with 6-10 Matt Riendeau and 6-9 Louis Gauthier, tagging off at centre. There is a lot to like about Ottawa. Gibson-Bascombe (19.9 points, 6.4 assists, 5.0 rebounds, 3.1 steals) is having a season no one should soon forget, even if he is going to get Brannaganed in end-of-season awards (the new new term for a player who is passed over for individual honours). Ward's averages, 16.9 points and 6.7 rebounds, rank favourably with any second scoring option. Ottawa has the talent to win this, but there are other factors. People say they don't know how young athletes will react to a new situation, but Carleton seems to have a good track record in such matters. They don't take anyone lightly; like Smart says, once he's gone through video and witnessed what other teams are capable of, it's usually an easy sell to get his players to realize they'll lose if they don't play all-out. They'll be able to run lots of defenders at JGB, who typically has to play the full 40 minutes when Ottawa goes up against a higher-ranked team. This is the first Capital Hoops Classic for the frosh small forward, Tyson Hinz, and Willy Manigat will be the first to play in it for both Ottawa and Carleton. Third-year Ravens such as Thompson, Aaron Chapman, Cole Hobin and Kyle Smendziuk are all in expanded roles compared to this time last winter. It is a bit of a cherry-pick to say Carleton lost to Lakehead on the last weekend before the break and Ottawa won by 40 in the same gym the next night. Subsequent events have suggested Lakehead is too up and down to serve as a true measuring stick. It should be a good one, but Carleton is a wee bit better. (Rob's reasoning. Carleton's average PF/PA this year are 86-60, plus-26; Ottawa is 83-67, plus-16. So right away Carleton is ten points "ahead." And by SRS, Carleton is 7.9 points better than Ottawa, so take the average of those to get about a nine-point differential. All numbers are rounded for simplicity. Then average 86, 60, 83, and 67 (the points for/against from each team) to get a 74-point baseline, then add half of 9 (the differential) to Carleton's score and subtract half of 9 for Ottawa. 39-39-43 No - not the measurements of your typical prom queen but the minutes played by Josh Gibson-Branscombe in three tough games this year (Queens, Toronto and Windsor (OT)). The best player in Canada (many think so) plays just about the entire game when the opposition is very competitive. The minutes-per-game story is very similar for Warren Ward and Donnie Gibson. Playing almost the entire game in the face of relentless, suffocating defence is a rather difficult proposition, even for the very best players. Legs get tired and, inevitably, shooting percentages drop and decision making tends to weaken. Should be interesting tonight to see how this scenario plays out. Neate: Great analysis--lots of stats to ponder. The post-Christmas break Ravens have been very impressive with their floor play and very quick ball movement. I think they've got too many parts, and while I think Ottawa's top 3 players are better than Carleton's, the Ravens, as an unit are a vastly superior team. Ravens by a dozen. 78-70 predicted, 74-66 actual. I don't know what I was thinking with that awful, awful prediction. McCleery is one of Carleton's top 3 players and he was the best player by lots tonight. Had a third of the Ravens scoring with 24 points on 10/15 shooting. Carleton took control of this game in the second quarter, outscoring Ottawa 20-7. JGB had a miserable first half, with 3 fouls and only three points. A lot of that could be attributed to the job Cole Hobin did on him. Hobin played the whole 40 minutes, highly unusual for a Carleton starter, and he spent the night shadowing Josh. Although JGB hit a couple of 3's in the second half he was basically held in check, scoring 13 on 4/13 shooting. He also had 5 turnovers. Credit Ottawa U for not giving up. They were down late in the first half 38-20, looking as if Carleton would breeze. Instead Ottawa reeled off a 17-2 run to narrow the lead to 40-37. Carleton regained its composure, though, and wound up restoring its half time lead of 15 by the end of the 3rd quarter. Thompson, McCleery and Hobin outscored JGB, Donnie Gibson and Ward 46-38 with each playing at least 30 minutes. Interesting that Carleton, known for bombing 3 pt shots made only 4 on 15 shots while ottawa had nine. Good points, 12:33 ... Hobin did a great job altering shots and getting blocks, and that put JGB off his game. He fought through it admirably to get 13 points and nine assists. It is odd Carleton was only 4-of-15 from three-point land. They did make 22-of-39 on two-pointers, right in line with the 58%. Smart also mentioned the eight turnovers in McCleery's stat line. That was a bit of an unsightly figure. A lot of those were when Carleton couldn't complete the interior pass that often leads to a layup for them. Overall, Ottawa did well to get the final margin down to double digits. Carleton wearied a bit. Of course, off-hand I don't recall if there were media timeouts at the half-quarter. They have those at Final 8. Refs were definitely a factor ... Ottawa certainly didn't play their best but some of those early calls on JGB were unwarranted. Didn't see the reflection on Carleton's side. Anyway that's how it usually goes when the Gee Gees play Carleton! just once i'd like to see a reasonably fairly called game!